We all experience the stressors of having to go to work. Even though we say that we enjoy or even love what we do, there are always going to be those bad days. It’s easier to say, “Take each day as it comes,” and, “Focus on the positive,” rather than literally act on our words. But, for real, sometimes, that is exactly what you have to do. Lately, I have been struggling with rotating between days and nights. My internal body clock is a shambles and my sleep schedule murdered. Some mornings, at 3AM, my stomach wakes me up as if I am working a night shift, ready to eat lunch. Not cool. If it isn’t my schedule getting in the way, it may be a difficult interaction with a patient and their family that I face. Whatever the hurdle, the resulting stress will sometimes cause me so much anxiety and fear that I just want to scream. That is literally the moment when I have to say, out loud to myself, “Girrrl, relax. Everything is going to be okay.” Beginning right then, I shift my focus to the positive aspects of my job and there are LOTS of those; my coworkers, the fact that I get to work with kids everyday and being able to witness the miracles of modern medicine; to name a select few. Yesterday, the positives were everywhere and a lot was put into perspective for me. After very little sleep Wednesday night and I mean very little sleep. We’re talking maybe two hours? I woke up on the very wrong side of my bed. Actually, I might as well have just woken up on the hardwood floor. Getting ready to go to work was the last thing that I wanted to do. Then I remembered, today was Super Hero Day. Ah yes, the benefits of working on a children’s unit. What is Super Hero Day, you ask? It’s quite simple really. 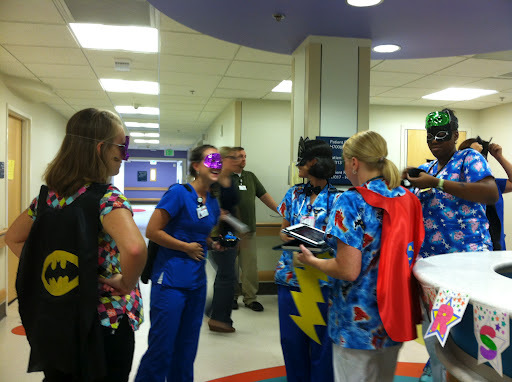 The staff on our floor, led by our fearless clinical unit leader Kathy, dressed up with Batman and Superman capes, there was lots of glitter and temporary tattoos. The nurses station and the computers were decorated. In the breakroom, for lunch, we had yummy food. We made super hero goodie bags for the patients and after lunchtime we paraded around the unit with our very own theme song (found on youtube at the last minute for your enjoyment) handing out the goodie bags, high fives and smiles. No shame or embarrassment what-so-ever. Some of those kids got so excited and it was amazing to see how a simple silly act made their day better. 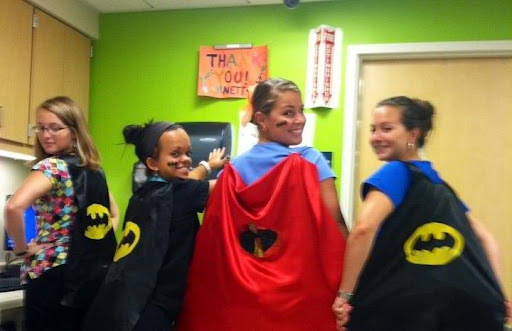 The true meaning of our Super Hero Day came later on when we got an unexpected visit from a patient. This little girl is a hero. The last time we all saw her she was non-verbal, could not walk or care for herself and we weren’t sure what the outcome was going to be. Well she walked onto our unit yesterday. I had to do a double take. There really are no words to describe the awe I was in. I started to cry along with some of the staff on my floor and then some of the doctors had tears in their eyes. And that is why I do what I do. Knowing that I was once in the patient’s shoes; sad, scared and angry at the world. I look back and remember the doctors and nurses who put a smile on my face even when things got hard. To know that I am now able to do that same thing is an incredible feeling. Being able to witness the miracles of modern medicine is the icing on the cake. So find the happiness and find the positives. Allow yourself to experience your feelings of sadness and anger but then let them go. One thing at a time 🙂 But I promise you, if you can smile, it will make everything easier. Remember, your smile is contagious and you never know who is watching.